Описание: На этой странице Вы найдете два разных курс разных издательств, которые предназначены для подготовки к международному экзамену английского языка TOEFL Primary - это такой детский вариант экзамена. TOEFL Primary Step 1 – рекомендован для учащихся от 8 лет, которые находятся на ранней стадии изучения английского языка (в течение 1-2 лет). TOEFL Primary Step 2 – рекомендован для учащихся от 8 лет, которые уже владеют первоначальными навыками в английском языке. После сдачи, помимо международного сертификата, ребенок получает подробный score отчет, который отражает сильные и слабые стороны в знании английского, дает дальнейшие рекомендации по совершенствованию языка и подбирает специальную литературу на сайте разработчика экзамена. 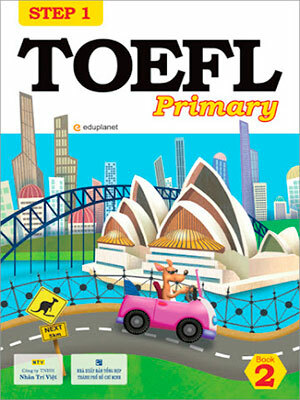 TOEFL Primary by Eduplanet - the purpose of this book is to prepare young learners for successful results on the TOEFL Primary tests created by ETS. TOEFL Primary, the first level of TOEFL assessment, is designed to measure young learners’ English ability, especially their skills in reading, listening and speaking. Each units of this book introduces new words that are related to a given topic in order to stimulate young learners to learn new words or review one that they already know. One of the many advantages of this book is that all of the reading, listening, and speaking sections of each unit are centered on a particular topic. This allows students to see how the target words, phrases, and expressions are used differently in each section. The contexts for each topic have been carefully selected to correspond with the real test standards, so learners will find expressions, phrases, and directions that are similar to those appearing on the actual test. This book will give young learners a chance to become familiar with TOEFL Primary tests by looking at questions in a variety of situations. TOEFL Primary Practice Tests by ETS - were created by professional test developers at ETS. The test questions are an accurate reflection of the questions found in an actual TOEFL® Primary™ test. The ideas expressed in the reading materials contained in the practice test do not necessarily reflect the opinions of the TOEFL® Board or Educational Testing Service (ETS®). English-language proficiency is an increasingly important skill for students worldwide, as it provides access to a wide range of educational, personal, and professional opportunities. Reliable assessment of progress in English language learning at a young age provides students with an advantage in their language proficiency development. Educational trends indicate a global need for a well-designed, objective measure of proficiency in English to help younger students.